Intermodal company turns 53-foot containers into mobile billboards to raise funds for charities. Hub Group raised $70,000 in the first year of its #CauseContainer charity campaign. Hub Group added the National Park Foundation and Chicago Blackhawks Charities to the 2017 chrity program. Hub Group, Inc., one of the largest intermodal solutions providers in North America, announced today that nearly $70,000 was raised in the first year of its #CauseContainer charity campaign. The inaugural year was so well received by Hub Group employees, charity partners, and the public, that the company has added two non-profit organizations to the 2017 program: the National Park Foundation, the official charity of America’s national parks and Chicago Blackhawks Charities. These two organizations will join current partners which include: Bright Pink, which educates on breast and ovarian cancer prevention and early detection; Ann & Robert H. Lurie Children’s Hospital of Chicago, the top children’s hospital in Illinois and one of the top children’s hospitals in the nation; and Fisher House, which provides housing to active military, veterans and their families during times of medical crisis. Hub Group commissioned the custom-painting of 53-foot intermodal containers to serve as mobile billboards for the non-profit organizations. The charity containers then traversed the country over the road and rails, transporting a message of hope and action. 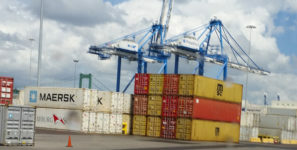 Since October 15, 2015, the containers traveled more than 155,000 miles, providing at least 22 million impressions, worth an ad equivalency of more than $500,000. Anyone can participate in the campaign by taking a photo of a Cause Container and uploading it to Facebook, Twitter, or Instagram with #CauseContainer. For every original photo, Hub Group donates $100 to the corresponding charity. Each time an original photo is shared, Hub Group will donate an additional $1, up to $20,000 per organization.